Spring is finally here and you know what that means…it’s time to start thinking about your veggie garden. I get so excited when the weather begins to warm up because I know that working in my veggie garden is coming. I love growing my own foods. Not only is it satisfying, it is a much healthier way to feed my family. So with that in mind, I thought that I would help you to grow a healthier and more sturdy garden. 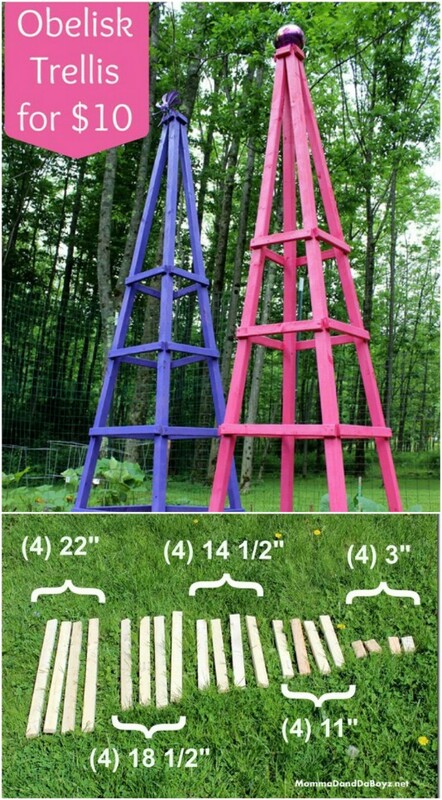 What that means is that I have found 15 DIY plant supports and cages that will help you to keep your garden plants supported while they grow those amazing veggies for you this summer. These are all so easy to make and many of them can be created from repurposed or upcycled materials. There is simply nothing better for me than turning trash into treasure, which is why I really love repurposing so much. From tomato cages that you can make from reclaimed wood to a wonderful trellis that is made from old bicycle rims, you are definitely going to find a great DIY plant support for whatever plants you have in your garden this year. And, speaking of gardens, have you seen my list of 10 homemade insecticides? These will keep your garden pest free naturally. These plant supports can be used for all of your plants, from tomatoes and beans to peas, cucumbers and even squash and pumpkins. If you have a plant that needs to be supported while it grows, you are going to find the perfect DIY plant support and you can make most of these in just a few minutes. Go ahead and get those supplies ready – we’re going to grow beautiful gardens this year and we’ll use our DIY plant supports to keep those lovely veggies coming all summer long! And, be sure that you take a look at these 25 DIY garden markers to keep those plants labeled and organized. 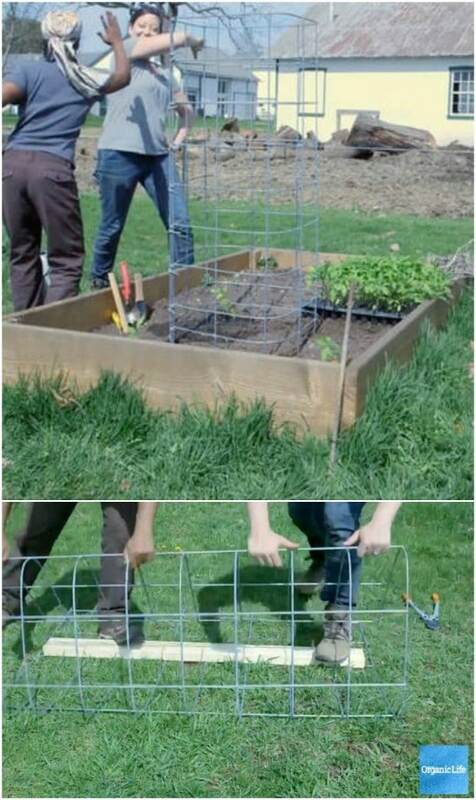 These folding tomato cages are super easy to make and will perfectly support your tomatoes as they begin growing. You can build these with scrap wood if you have any on hand and they go up pretty quickly. Plus, they are foldable so when you are not using them in the garden, they are easy to store and take up very little space. You can build these plant supports for less than $4 each and if you are using them for beans or other vining plants, you could use one support for each couple of plants in your garden, so you may not need many. These are great for tomatoes and only take a few minutes to put together. You make them with bamboo stakes, which are really cheap and if you happen to have cane growing in your backyard, you can use those, too which would make these free to make. There are so many projects to repurpose old tires, but not many that actually let you use the rims of those tires. 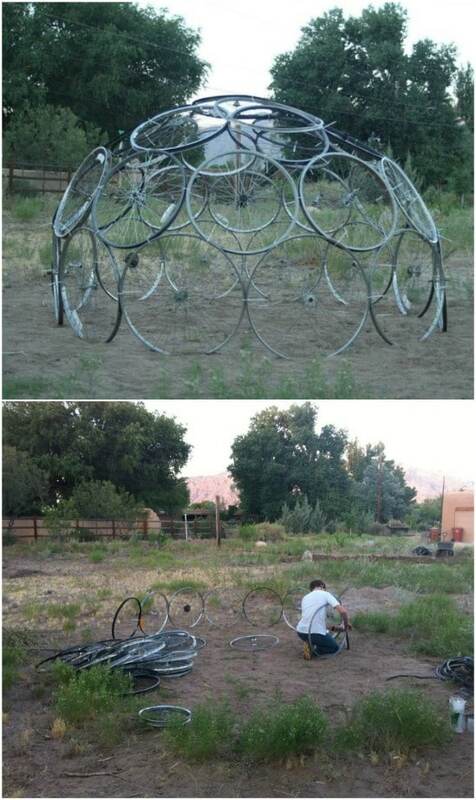 This dome shaped plant support uses old bicycle rims and it is really easy to put up. It’s also super unique and perfect for any vining plants that you have in your garden, including cucumbers and beans. And, you just have to zip tie the rims together to create it. So, if you have a couple of large planting pots and a few branches in your yard, you can create these lovely potted branch trellises that are perfect for vining plants like cucumbers, peas and beans. This one doesn’t even take that much work to put it together and if you have the branches and planters on hand, it’s a free DIY plant support project. If you are growing heirloom tomatoes, and if you have ever grown them before, then you know that you need something really sturdy to support those plants as your tomatoes begin to grow. Heirloom tomatoes get so big that they need additional support to keep them from toppling your plants over. This sturdy DIY tomato cage is made with cattle panels so you know it is going to give your plants the support that they need. And, it’s a pretty easy DIY project, too. 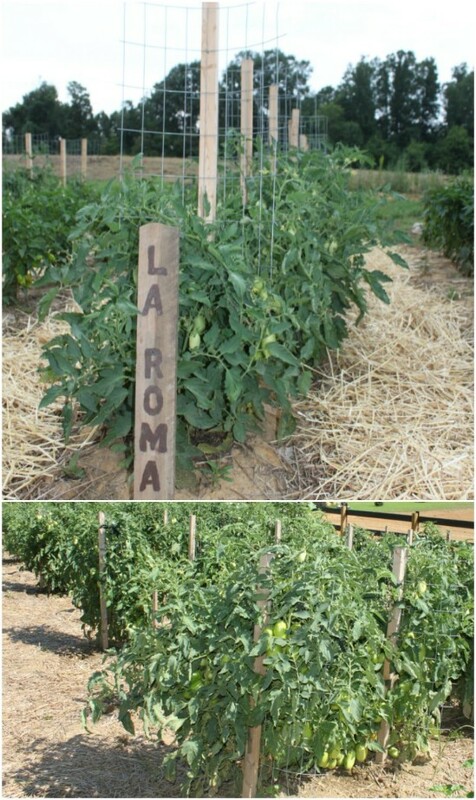 This combination of wooden stakes and chicken wire is perfect for keeping your tomato plants secure as your tomatoes grow. And since you are using wooden stakes at the beginning of your rows, this is also a great way to DIY your own garden markers. Just carve or write in whatever type of tomatoes are in that particular row. The wooden stakes and wire give your plants the perfect support while they are growing. 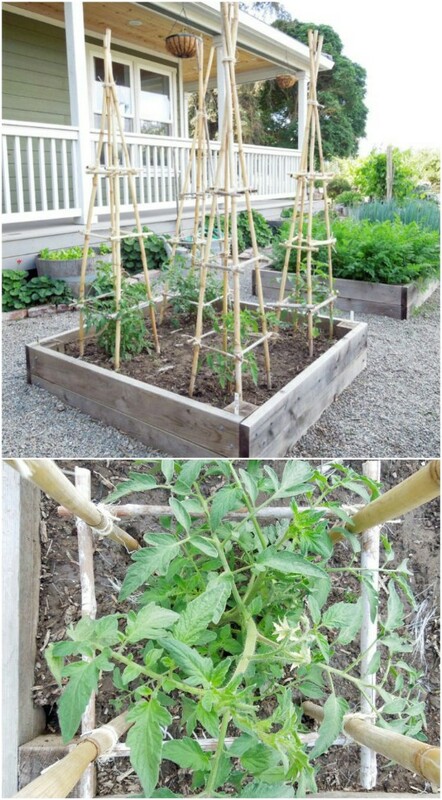 This DIY plant support gives you sturdiness for all of the tomato plants in one row. You only need one cage per row and all of the plants can grow up the support at the same time. This would also be great for beans or peas. It is a pretty simple DIY plant support cage to make and you just need a few supplies, like galvanized welded wire panels and rebar for support. These cheap and easy to make trellises are not only supportive for your plants, but they are also really attractive in the garden. Paint these colorful hues to really make your garden noticeable. They are so simple to put together and each one only costs about $10 to make, even less if you happen to have some scrap wood on hand. These are perfect for any vining plants like your beans and peas. 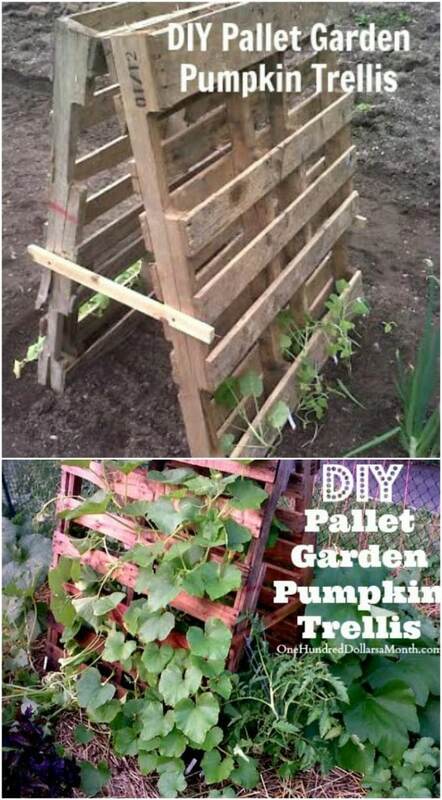 This plant trellis is perfect for pumpkins, squash and other vining plants and it is really easy to make from a couple of old pallets. If you have a stash of pallets and you have been waiting for the perfect pallet repurposing projects, this is definitely one to consider. It will only take you a few minutes to make one of these and if you have enough pallets on hand, you can use them to support all of your garden plants that need it. 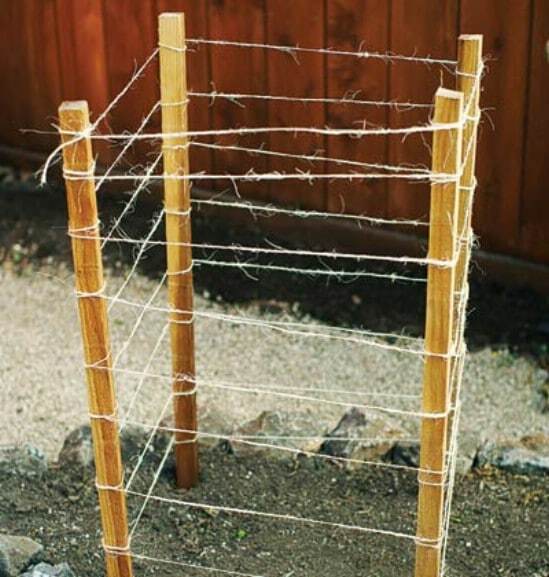 This tomato cage is made from stakes and twine and it only takes a few minutes to put together. If you have a few small wooden stakes on hand, this one is really cheap to build and it perfectly supports tomatoes and all sorts of other garden veggie plants. Even if you have to buy the stakes, this is still a really inexpensive DIY plant support project. These bamboo teepee styled towers are really easy to set up and you don’t need anything to make them but some bamboo stakes and rope or twine. 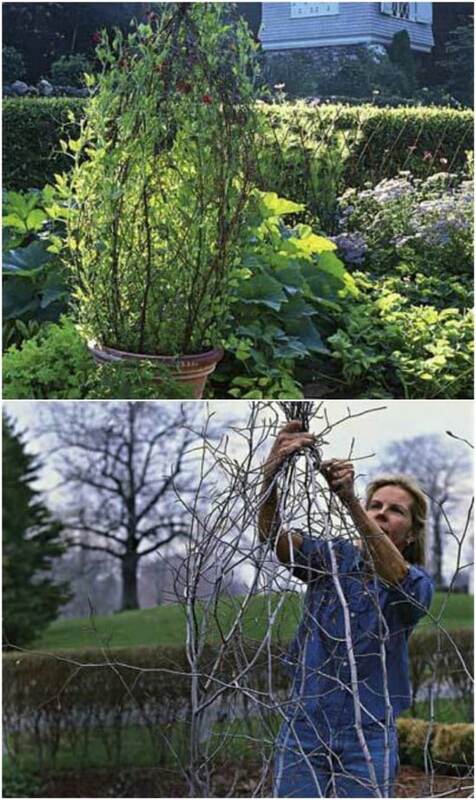 You could also do these with branches if you have a few in the yard. This would be a great project for upcycling twigs and branches from the yard and these teepees are perfect for supporting tomato plants as they grow. 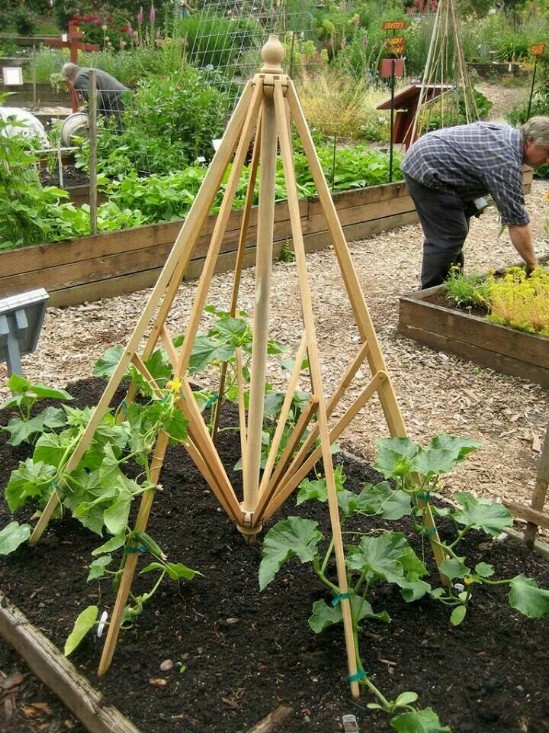 This umbrella styled teepee will support all sorts of vining plants like your tomatoes, beans and peas, or you could even use it for squash and zucchini. It is made with wooden stakes and it has such a decorative look. If you really want it to decorate your garden, add some finials to the tops. 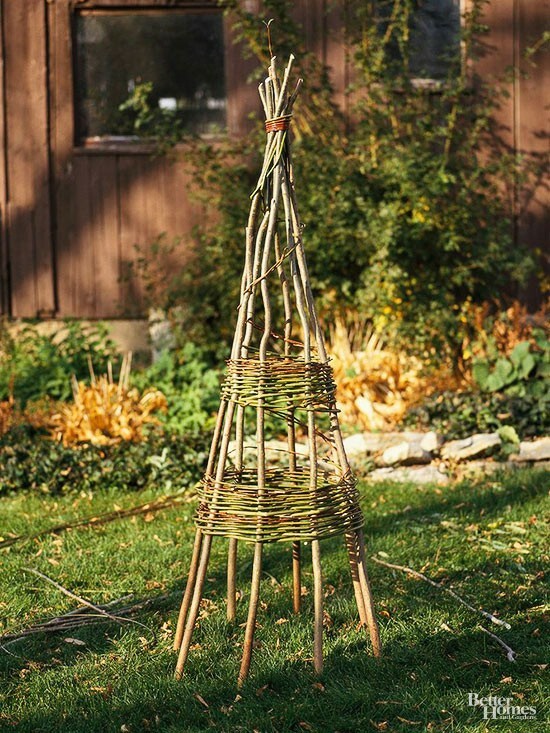 If you have a willow tree, you can use branches and twigs from that tree to make this teepee styled tomato plant support. This one could also work with beans and other vining plants. It’s pretty easy to make and you can do the entire thing with your willow twigs and branches or you could use rope or twine to tie all of the supporting branches together. This tomato cage is made completely from wood and you can use scrap wood if you have any on hand. 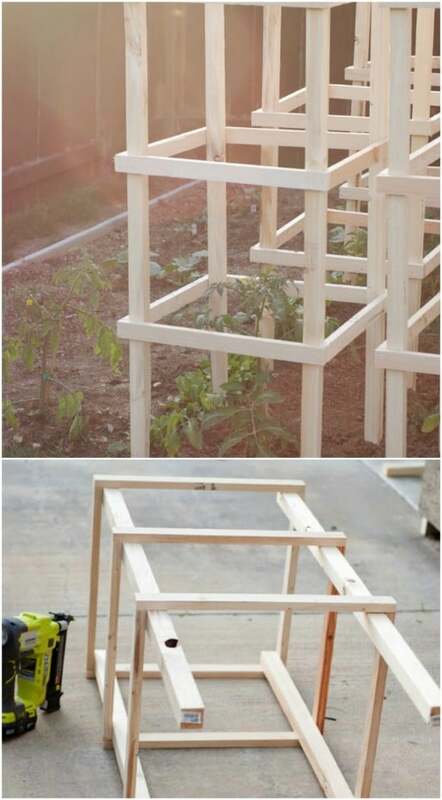 These are really easy to make and this is a cheap plant support project even if you have to buy the wood to build it. It offers perfect support for tomatoes and you could use it for your beans and cucumbers, too. Just start the vines up the cage when they begin growing. PVC pipe is not terribly expensive and you may have some on hand – I always have a few pieces in the garage for DIY projects. 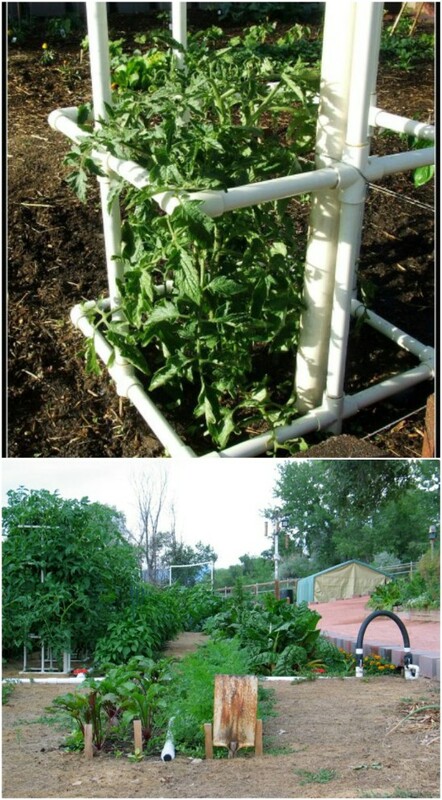 This easy to make DIY tomato cage is crafted from PVC pipe and it perfectly supports those plants as your tomatoes begin to grow. This is even a good one for heavier tomatoes like heirloom varieties. And, it only takes a few minutes to put together. This is a great one to add to your list of PVC pipe organizing and storage projects.